Can you believe that March is already here? This year has gone by so quickly already and Easter will be here before we know it. 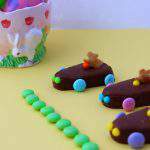 I’ve got a cute and easy-to-make kids’ snack that will help you and your kids to get into the mood for spring: Easter Bunny Racers! These cute little snacks are not only adorable, but they are super easy to make. Your kids will have so much fun picking out their car’s wheels and bunny driver and making their car their own. This could also be a great activity for kids’ parties, because who doesn’t love to eat Reese’s eggs this time of year? Start by opening the top of the Reese’s eggs. Be sure to dip your knife in HOT water to melt away the chocolate and not break the egg. Using your frosting attach the regular sized M&M’s on the bottom for wheels. Add mini M&M’s for the steering wheel and headlights. Attach with the frosting. Press the bunny in the drivers seat and you are ready to go! 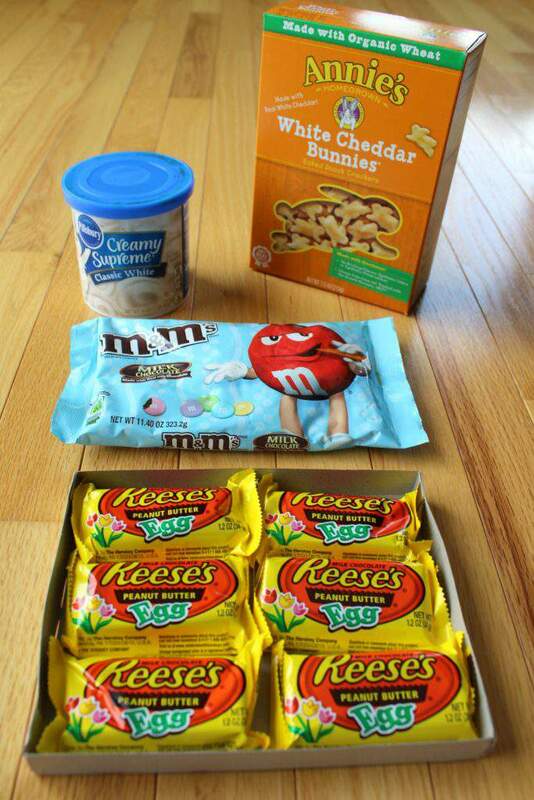 First, you’ll need to gather your ingredients: Reese’s Peanut Butter Eggs, M&Ms, mini M&Ms (or other small candy), vanilla frosting, and Annie’s bunny crackers. Carefully cut away an opening in the top of the eggs for the bunny’s seat. A good tip to making this job easier is to dip the tip of your knife in some hot water first so that it can help to melt the chocolate so that it doesn’t break the whole egg. Next, use your vanilla frosting to attach the regular-size M&Ms to the egg as wheels, and the mini M&Ms for the steering wheel and headlights. Lastly, press a bunny into the driver’s seat and you’re all finished! How easy was that? Wouldn’t it be fun to find these in your basket on Easter morning? These cuties will make Easter even more fun…and delicious…this year! 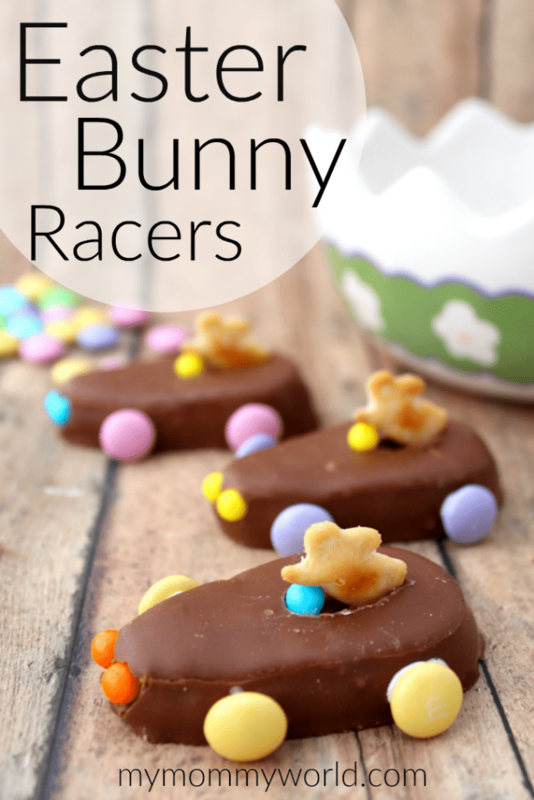 I hope your kids enjoy “racing” their very own Easter Bunny Racers this year! This is such a great idea, Erin! I love it. 🙂 And I know my kids would be thrilled to create their own racers. These are so cute. What a great idea. I pinned it! I pinned it too. So cute! These are so cute! What a fun Easter treat to make with kids. Pinning and sharing . Thank you for sharing, and for being a part of the Hearth and Soul Link Party. Hope your week is going well. Those are so cute! Thanks so much for sharing with us at the Welcome Spring party. Pinned. What a fun treat idea to make and display for Easter. Thanks for sharing on MM. Pinned and will be featuring this idea. Super cute idea the kids will love. Cute – thanks for sharing at Fiesta Friday! Your Easter Bunny Racers were recently featured on Full Plate Thursday and thanks so much for sharing this recipe with us! Have a great week and come back soon!